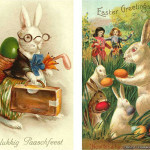 Home→History→Why Do We Eat Chocolate Bunnies on Easter? It didn’t take long for the early Easter bunny tradition of building nests to turn into building baskets filled with candy and treats. And in the 18th century, it was fairly normal for children celebrating the holiday to receive paper or cardboard rabbits stuffed with treats. In the late 19th century, as the Germanic-centric Easter celebrations became more widespread in the states, the Industrial Revolution turned chocolate into a much more affordable, accessible snack for the masses. So, instead of stuffing paper rabbits with candy, parents were able to make the rabbits out of chocolate.